A beautiful mess. What am I as a mother, if not a beautiful mess? Sure, some of the time I have it together. The kids get to school on time, the laundry gets folded, the groceries put away, the slippers traded in for shoes as I head out the door. Other times, I fall into a hug from a friend with the relief that someone else understands my crazy. As I reflected on the theme for this upcoming year, I realized it was deeper than just the visible mess: the toys, the clutter, the dog hair, the family chaos. When I feel, deep down inside, that I’m a mess. That I don’t know what I’m doing. That I’m grasping at straws with my parenting. That I’m nagging my wonderful husband. That I’m exercising and getting nowhere. That I’ve let down a friend. That I’m confused by my faith and the purpose God has for me. That I question everything. That I can’t get anything right. And yet, I am the beautiful mess that God created. He has a plan for me, and while I may only see the lint and dust and grime around the edges of my soul, he has created me to be this way. In His eyes I am beautiful, with or without the mess. In His eyes I am perfection. So I can stop striving for my own perfection. I can breathe. I can close my eyes and see. In His eyes I am already there. My kids love me. My husband adores the woman I am. And I’m doing a good job. May you give yourself a moment of grace. May you stop and know that you are God’s beautiful mess, exactly the way you are. My family and I were taking a trip to Missouri to celebrate Father’s Day. We had encountered some unexpected fuel problems while still on the ground in Portland. Our flight that was scheduled to leave at 6AM didn’t depart until 11AM. A small bump in the road. 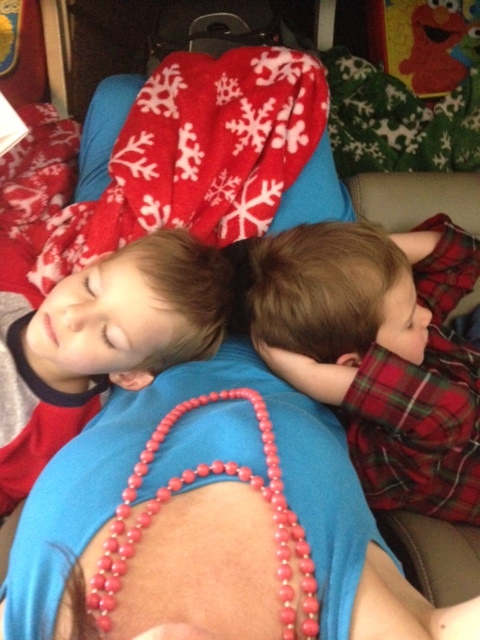 Something I am accustomed to while traveling with 3 boys. Minutes within taking off, my youngest were fast asleep and Abe was happily engaged in technology. The day was quickly improving. Somewhere between Portland and Chicago, however, we encountered some heavy turbulence. Unexpected. Despite flying regularly, I was taken by surprise. And scared. I watched as grown men clenched their arm rests with white knuckles. And then set eyes on my boys. 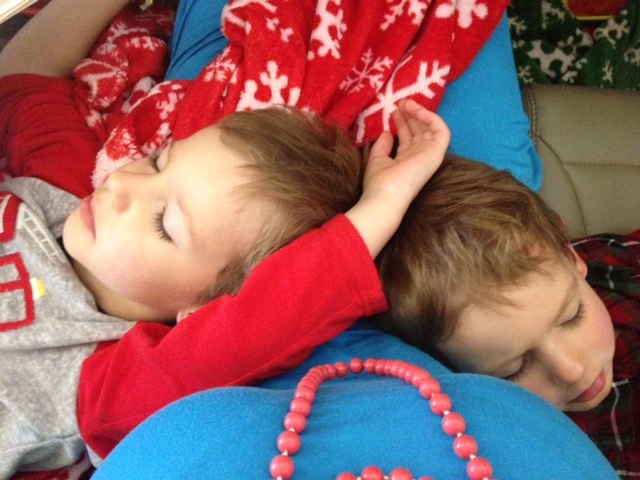 Abe was still engrossed in Mine Craft and the twins slept soundly on my lap. Not phased. They were fearless, resolute – even in the midst of turbulence. I was reminded that is what God calls us to be as people of faith. When the skies get bumpy, our solace and peace should be in the Lord. He longs for a relationship with us. For us to trust in Him. Believe. I raised a prayer up during the midst of the bumping and shaking. The words of my Granny rang strong, “People who pray don’t need luck.” The turbulence was short-lived and The Littles continued to sleep the reminder of the flight. I felt the presence of God that day in more ways than one. Continued prayers for all of us and smooth skies ahead!